I have been actively involved in NETRA for the past seven years. In 2008 & 2009 I acted as Pee Wee Advisor in our youth program. In addition to being on BOD, I am on the Competition Committee and serve as the Hare Scramble Vice Chairman. I have been involved in NETRA for the past 10+ when my children started racing. In 2008 & 2009 I was a Pee Wee Advisor in our Youth Program. I attend many of the events to support my family and friends. Started riding NETRA Junior Enduros during the late 70's; eventually moved to California where I was the President of the California Enduro Riders Association and an AMA District 36 committeeman; also rode and raced in Texas for a few years. Now a member of the Pilgrim Sands Trail Riders and ride selected enduros, hare scrambles, and turkey runs. Tony has been riding since he was a kid and has been competing in NETRA since 2003. 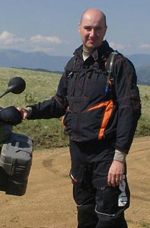 His riding exploits include traversing the Trans-America Trail on his adventure bike and riding in Baja. He's has served as a trailboss for the Pathfinders MC and initiated the club's Trail Patrol safety initiative at Thomaston Dam in 2003. He also serves on the NETRA Competition Committee and as a rider representative for the enduro series. I have 50 years motorcycle riding experience, 40 years riding off road, Joining NETRA in 1971 prior to the first general meeting held at Mountain Park in Holyoke MA. I have been a member of the NETRA BOD for more than 20 years, former Vice President and former President. Twenty years on the AMA Congress as the off-road delegate for New England. I am a 40 year member of the Rhody Rovers, was trail boss for the Rhody Rovers first Enduro in 1969 and trail boss for many Enduros since then including five National Enduros. I was the National Service Manager for Bultaco Motorcycles in the 70s. While employed by Bultaco, I lived in the Schenectady NY area and was one of the original members of the Capital Area Trail Rider Association. I have been a member of, and attended the AMA/FIM International Public Policy Conference, the AMA National Summit on Motorcycle Sound, and the AMA Leadership Summit on Recreational Riding. I have been trained and certified as Sound Technician and I perform the sound testing at the AMA Dirt Track Grand Nationals in DuQuoin IL each year. I am on the Board of Directors of the Rhode Island Off Highway Vehicle Assoc., am a member of the Central Cycle Club and the New England Hillclimbers. I am a Motorcycle Safety Foundation licensed Dirt Bike School Coach and an ASI licensed ATV Safety Instructor. I first learned about NETRA when I met my now husband back in the late 80s when he raced in Hare Scrambles and Enduros. After a bad crash and injury he decided to take a break. We started back again with our two young girls in 2003 in Nervous Novice then the first Pee Wee ever late that year. We all became involved in Netra joing the "Nutmeg Scramblers" and racing pee wees then on to Jr Enduros and Hare Scrambles.Our oldest daughter won the Jr Enduro girls championship in 2007. For us getting invovled with helping put on events and learning the process has helped put all of this in prospective. There is alot of work from alot of people to put on an event. I have since become a BOD member and then Competition Commette member of Netra and President of the Nutmeg Scramblers Motorcycle club in Ellington CT. We spend alot of weekends throughout the year at Netra events meeting new people from all over New England. My time with NETRA goes back to my childhood racing motocross. At the time there were no Jr. Enduros - only Senior Enduros. My friends and I put on Jr. Enduros in our town, so I wrote a letter to Trail Rider Magazine's Bob Hicks asking why there were no Enduros for kids in New England. He published my letter and soon after, Jr. Enduros were added. I have competed in Hare Scrambles, Enduros, Turkey Runs, and Charity rides through the years. After a nearly 15 year absence from the sport, my family and I have returned. My daughters Chelsea and Stacey started in nervous novice and then pee wees and are now competing. I have also started racing again. I feel it is my turn to give back to the sport and organization. I am not finishing my second year as Youth Coordinator, Competition Committee member, and Board of Directors member and am a member of the Nutmeg Scramblers Club. Kevin Howley has served on NETRA's Board of Directors and as NETRA's Treasurer for more than twenty years. Kevin first became involved with NETRA in the mid-eighties attending NETRA enduros as a pit person for his older brother and a friend. Kevin began riding NETRA hare scrambles late in 1986 and enduros in 1987, and competed in both series until the mid-nineties. Kevin still competes in the NETRA enduro series in the A Senior class. NETRA enduro competitors are more likely to recognize Kevin's wife Jennifer than they are him, as she has pitted for Kevin and other enduro riders at virtually every NETRA enduro for the past twenty years and is always out on the course. Kevin's twin daughters, Julianne & Kaitlyn, ride some of the NETRA Pee Wee events. Kevin is a member of the King Philip Trail Riders and is actively involved in the club events. Kevin is a Certified Public Accountant and lives with his family in Wrentham, MA. I started riding in 1966. In '68 I was selected to circuit ride in the Libyan Sahara on a Moto Guzzi 125 to teach English for the Peace Corps. Unfortunately, Khadaffi deposed King Idris. forcing early termination of sponsorship. Followed by years of street riding (mostly BMW's) and roadracing (Norton Commando) and pit support for eventual Battle of the Twins Mod Prod Nat'l. Championship with John Long aboard the Gietl/Schuster BMW Superbike. Along the way, became active cornerworking roadraces for AAMRR and LRRS with U.S. Marshals. Joined MVTR in 1990 to find places to ride, volunteered to work club events, and wound up on the NETRA BOD. Still love riding-pavement and dirt. Jim Sherman, NETRA’s current vice president, became involved in the organization during the 90’s, when his son began participating in NETRA Junior. Enduro events. What started as simply supporting the kids at their rides evolved into club involvement with the Hoot Owl Scramblers and supporting other NETRA clubs when possible. Today Jim is the co-secretary of the Hoot Owls and regularly is the trail boss for the Hoot Owls’ Junior Enduro. Jim served as NETRA president from 2007 to March 2013. Jim lives in Medfield, MA and works in Bethesda, MD financing seniors’ housing and assisted living facilities. If you are a NETRA member who has never logged into the website before, you will need to verify and setup your account.